I saw a local publisher calling for horror stories. I used to have lots of ideas but for now it is zero because I now don't want to think of such thing because it attracts negative energy. Actually, it is been a long time I have not thought of eerie scenes. Suddenly when I want to think, I can't think of any. Argh! I am rusty now! Just wondering what setting and what kind of horror stories do you wanna read? Ah. It's been a long time I have written lyrics. There is one lyric that I channeled.. I didn't even know it. Usually I like looking up to the Japanese lyrics because they are written with meanings and very poetic. We travel this road to find happiness. See? You look good with a smile on your face. These beautiful, fragile days are reborn, unfaded. whenever I turned around, you were there. Everyone is a traveler, carrying his own never-healing wounds. How many times have I gotten lost? warm helping hand was you. *At the end of this long path, what will we think? Everyone is a traveler, wandering about in search of love. Let's go together until we tire of it. That's why I like haiku too. Time to go back to writing lyrics. Inspiration, bring it on! I was listening to the kids singing. Woah. They are prowess. I envy but it makes me motivated! But you know what I noticed from the video? The grandpa told her to follow her heart. Yes, the kid follows her heart. So young at age, she is taught to trust her instinct. No wonder some kids are more independent than others. This is what we should be teaching our kids. Not to make all decisions for them. Ask them what they want. Not what the adults want. It's not about getting hitched. It's about the cat not running away from me!!! OMG. What an achievement! Usually cats dislike my energy as opposed to dogs. They run away whenever I come near. And this just stayed and took photo with me! 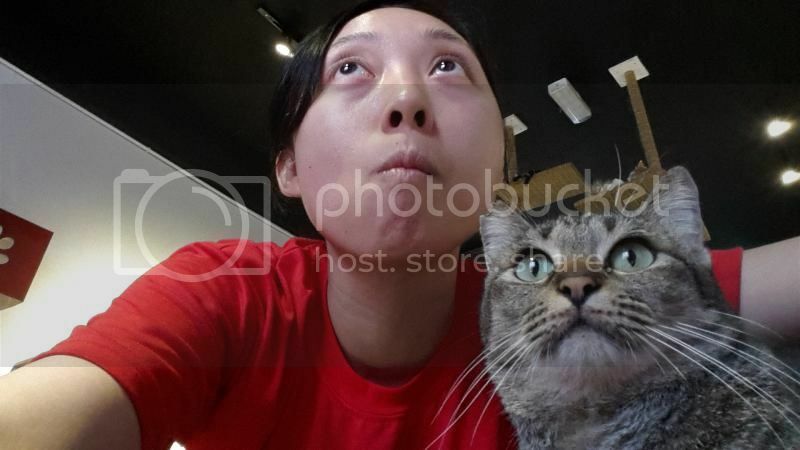 Oh, I took this photo at a cat cafe near my office. I spent my day sleeping and playing board game with my friend and his cousins. How nice to be able to spend time with cousins. Unlike mine... I don't even know who my cousins are... I have met some and they are real snubs. How sad. All politically played by their parents. Nevertheless, I will try my best to live everyday to the fullest! I know there are people who learnt tarot for fun and for practice they may use the tarot to unreveal a person's future without the person's knowing and even permission. That is actually considered as non-ethical. I have been advised by my teacher not to do that even for practice. If I wanted, I should just get some guinea pigs and get their consent and feedback. I don't know how some of my friends commented that 'who knows (renaye) reading my future with tarot' like just this morning. I seriously dislike that comment. It is not the first time I heard it but many times already. And when they asked how do I know... I really feel like shooting back 'you told me so sometime ago' or 'you posted your activities on FB'. If you don't want people to know your activities at all then just don't post certain activities at all. It is very simple to connect the dots nowadays when uploading picture have date and time. And don't breathe a word about it too. I considered myself as an ethical tarot reader. I will only read a person's future, not even third person depending on the situation, when only asked. Not for fun. Why spend my energy on insignificant trivials? Some people are so 'I want the whole world to know about me and my work but I am scared to be present to the public'. Then continue to be a closet artist.